V800 helps you reach your peak when it you need it most. It integrates GPS and 24/7 activity data for accurate training and recovery data. It has a large, scratch-resistant Gorilla Glass lens with a high-contrast, black and white display that's optimized for low-light conditions. 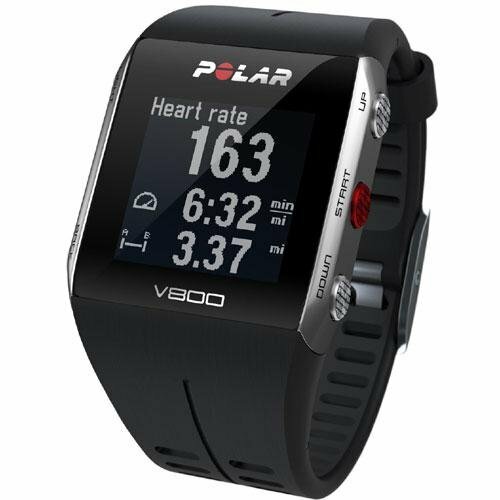 With unique training features, real-time multisport guidance and in-depth training insights, the V800 is the ultimate choice for the most ambitious triathletes. Key features include: integrated GPS for speed, distance and route tracking, 14 hour rechargeable battery life, altitude, ascent and descent with the barometric altimeter. Also has customizable profiles for multiple sports and seamlessly changes between sports - recording full performance, including transition times. Syncs your workouts to the Polar Flow app and web service where you can plan and analyze your training. Waterproof to 100ft (30m) and suitable for swimming. Includes H7 Bluetooth Smart heart rate sensor for accurate heart rate while training and even while swimming.